A first-of-its-kind educational trip to China saw 14 students from London South Bank University (LSBU)’s School of The Built Environment and Architecture visit the cities of Harbin and Nanjing on a two-week architectural tour, boosting students’ professional development. The trip was conceived and led by Dr Nader Matter, Senior Lecturer in LSBU’s School of The Built Environment and Architecture. 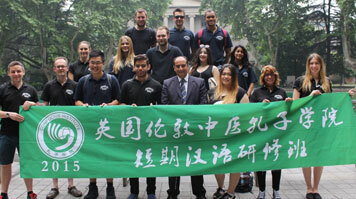 Nader commented: "The itinerary for the trip was designed to expose students to the diversity of cultures within China and to give them an insight into the qualities of Chinese architecture across time. I wanted the experience to be influential and inspiring for students, and also to give them the opportunity to learn more about architecture and urban engineering in an international context." With this goal in mind, Nader led the participants in a well-organised busy programme of activities, including guided excursions to significant sites, presentations by staff at local architecture schools and universities, Chinese calligraphy workshops, Mandarin lessons and a visit to one of China’s largest architectural consultancies, GOA. The trip was supported by LSBU’s Confucius Institute, Harbin Normal University, China, and LSBU’s School of The Built Environment and Architecture. BEng (Hons) Civil Engineering student Michael Patrick Collins commented: "This trip has been a valuable experience in my professional and personal development and I have gained a deeper understanding of the culture and architectural engineering qualities in China. I feel extremely fortunate to have attended this educational excursion and would strongly recommend it to others. I will always remember this trip with many fantastic experiences." BSc (Hons) Quantity Surveying student Rosalind Watkins added, "I can honestly say that this trip has been one of the best I’ve ever been on. There was excitement round every corner. I’ve loved experiencing the different aspects of China and doing it together with such a great group of people is something I’ll always remember."